This image was taken just down the street at the neighbourhood park, during the January thaw. It was spring…January style. I love the blue, pebbly texture of concrete against the smooth-as-glass puddle. 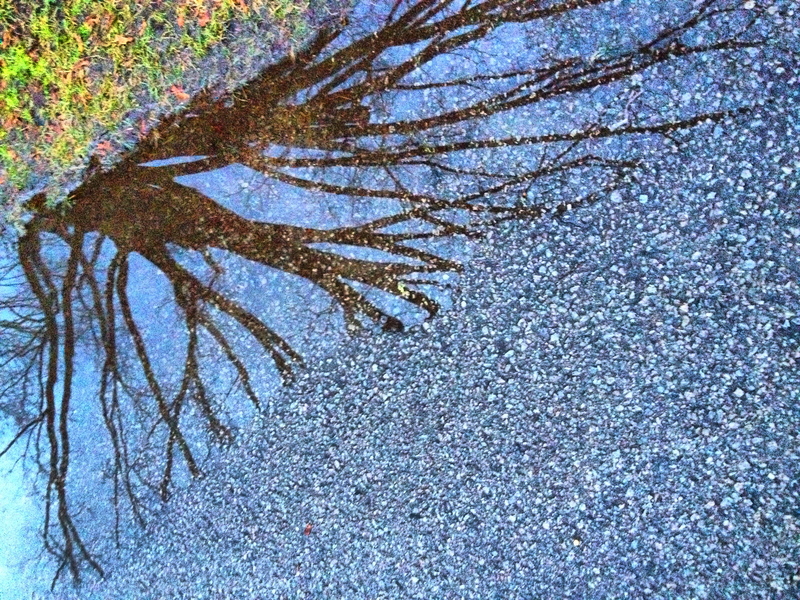 The reflection of a fragment of winter’s tree. And, that patch of brilliant, bright green. Definitely a taste of spring. Countdown to Spring – 15 days! What a beautiful ode to spring! Love the abstract quality of this image – the three different sections, which combine together to form a dramatic whole. I love the wonderful layers of color here, Juli, and that reflection is just beautiful. Wishing you a fantastic day! xo. I love the colors and textures in this! I love the blue and green tones, and upside-down tree reflections are a favorite subject. Lovely!